I was born on the 17th of February 1955 in Georgia. 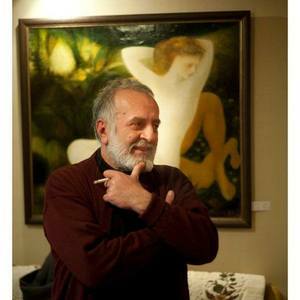 My father, Mikhail Arbolishvili was an artist, my mother was a teacher of piano, and thanks to these facts I was brought up in harmony with art. Georgia is a wonderful country with ancient history. Georgians appeared in the Caucasus and have been living there ever since. Not so long ago our anthropologists found a skull of an ancient man in the eastern part of Georgia. His age is considered to be 1 700 000 years. Do I plan a picture before hand? It's not me who plans, but all the life I have lived. I just try to let all the surrounding information through me and it remains on the canvas. All my most successful pictures are created the way that I don't remember the process of painting. I very seldom know what result can there be. All the information comes from upward - it passes through me, but it belongs to everybody. I am just a transmitter. I work every day to be in good form, to let the information pass through me in the purest condition. As a priest should pray every day, the same way a painter should draw. A painter mustn't waste time.I became reserved and spent all the time in my studio. I know that I always must be ready to receive an impulse, which may turn out to be a picture. People often ask me what branch of painting I refer myself to. In one of my interviews I said that I am just as I am. I am a painter without any 'isms'. My art depends on my feelings, my mood. Mostly all my pictures are created under the influence of love. Love is on the whole the most important thing for me. I perceive love as a living being. It exists not only in the world of imagination, but in the real world,too. Sometimes love hurts very much, love doesn't depend on us, it exists by itself. Since 1976 I participate in republican exhibitions and since 1989 I take part in international exhibitions. My first personal exhibition took place in Hobby Gallery in Tbilisi (1997). The second one was in State Picture Gallery in Tbilisi (1998). Besides my exhibitions took place in the hotel 'Sheraton Metekhi Palace', but they were private, elite, only for CD. In the 90-s I had exhgibitions in Germany in Ruhr, Duisburg, Koln , Dusseldorf. In 1998 an American company 'MVP International' offered me to take part in a program meant to improve American understanding of Georgian art. I was invited to Virginia Commonwealth University. I met with young American painters there. In 1994 I received an offer to publish my biography in the eleventh edition of 'Who's Who' guide. It was also very important for me to learn that three of my pictures were sold at the auction of Phillips, the pictures are printed in two Phillips catalogues. One of the most significant exhibitions for me took place in International Monetary Fund in Washington. There is also a constant exhibition in Alla Roger's Gallery in Washington. A collection of about thirty of my paintings stays in Richmond, the capital of Virginia in USA. A well-known violinist Liana Isakadze, who lives in Munchen now, bought about six pictures. Some forty pictures are in Moscow at the moment. About 200 pictures are now in different parts of the world, from Australia up to Canada. One of the most interesting on my paintings-it’s the history about ‘The White Peacook’. It was bought by the family of George Harris and they then gave it as a present to the Cathedral Church in Florida.When I asked them how a peacock may be in a church,they told me that my reflection of the white color is so good that it’s no matter it is a peacock. For them the painting is full of religious meaning for it’s color it reflects. For viewers who like art-it’s beauty.For an artist it’s like a machine of time.When I look to my paintings I return at the time when I created it.It can’t be called pleasure,it’s happiness.